RiSE offers cutting-edge research at Rutgers' flagship New Brunswick Campus in biological, physical & social sciences, engineering, math and exciting interdisciplinary areas . PARTNERSHIPS with REUs: Green Energy Technology, Cellular Bioengineering, Advanced Materials, Toxicology & Pharmaceutical Sciences, Proteomics/Bioinformatics. By applying to RISE, you can opt to also be automatically considered for partner programs. OUTSTANDING PROFESSIONAL DEVELOPMENT: Scientific writing/speaking, GRE prep, graduate school & career guidance, guest speakers & networking, field trips to industry. EXCELLENT FUNDING: Stipend up to $5,000 + housing + travel. GREAT LOCATION at the hub of pharma, biotech & telecom with easy access to New York, Philadelphia, Boston, DC, and more. 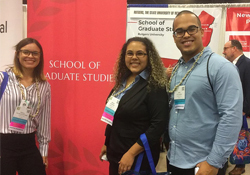 ALUMNI SUCCESS: Awards at national conferences & placement at top graduate schools. FELLOWSHIPS valued up to $100,000 for RISE alumni who return to Rutgers for graduate school. FUN & FRIENDSHIPS: Vibrant, inclusive community, social program. Although we do not have a hard deadline, we recommend that you apply by February 1.